ALL GREAT MUSKIE ANGLERS HAVE something up their sleeves, a little extra that gets them bit when everyone else blanks. Call it a bag of tricks that never runs out and keeps mystifying muskies. Tricks are most beneficial in trolling applications. Most anglers focus on just a few variables when trolling for muskies — generally location, speed, depth, and lure selection. In truth, the variables are almost endless, but here's a selection of new approaches and imaginative tricks to work magic for you. Muskies feed heavily on suckers, drum, and small carp that regularly seek soft-bottom areas. These locations warm quickly in spring, retain heat throughout the day, and provide food of various sorts for rough fish. Carp and suckers rest in these areas, lying belly to the bottom until something spooks them. Then off they go, leaving a dirt trail in their wake. The same type of disturbance is created when a crankbait grinds across a soft bottom, and muskies take note. To create this effect, allow one or two lures in the trolling spread to occasionally contact bottom and raise a cloud of dirt. Use this approach when fishing across mudflats largely devoid of snags. With 80- to 100-pound-test PowerPro, quality drags, and beefy rod holders, the occasional snag can typically be addressed without losing any gear. Every time I hop in the boat with guide Bret Alexander, I take note of what's new and prepare to learn. Last time, I thought he'd left his 7-year old son, Brody, unattended with a handful of colored markers and some of his favorite trolling lures. But the guide soon 'fessed up to his mediocre art skills, then recounted how 60 percent of his recent big fish had come on these "custom" baits. With unique combinations of pink, purple, and green, muskies had certainly never seen these patterns before. Nor could they be easily replicated by other anglers. Fishing pressure was high around us and these not-so-subtle color changes seemed to make all the difference. So don't be afraid to doctor baits. A touch of glow paint on the lip can be especially productive in stained water or when night trolling. Be mindful that, in most situations, less is more when it comes to glow patterns, however. Another wrinkle I observed in Alexander's boat was the use of spinner blades ahead of his leaders. He trolls crawler harnesses for walleyes a good part of the summer so seeing spinner rigs was no great surprise. But seeing them on his Fenwick Muskie Elite Tech trolling rods, with 80-pound braid and a 3-foot leader of 100-pound test fluorocarbon, was an eye opener. The concept behind the blades is twofold. First, the flash and vibration of a blade acts as an attractant. Every object leaves its fingerprint as it moves through the water. By combining the fast-turning vibration of a blade with the crankbait's slow wobble, the odds of attracting a muskie can dramatically rise. The spinner blade may also resemble a small baitfish being chased by a larger fish. Competition serves as a great motivator to trigger strikes. The blade's second purpose is to stop floating weeds from fouling the lure as they slide down the line. With the blade positioned three feet ahead, a small amount of weeds far up the line doesn't dampen the action or appearance of a crankbait. Captain Paul Delaney has another trick for trolling areas with floating vegetation. "There are times when you know where you need to be to get bit, but floating weeds drive you crazy," he notes. "Here's a slick trick for that situation. First, cut a heavy-duty straw in half and make four slits halfway down the top of the straw. Slide the cut end of the straw onto your mainline. Then add a bead to the line that's larger in diameter than the straw and tie the mainline to the leader. The slots of the straw open like an umbrella while trolling, catching weeds before they get to the lure. As an alternative in thicker vegetation, Delaney uses recycled treble hooks cut off other lures. After removing all points and barbs, he places the hook and a bead in front of the leader to snag any problem weeds. If you're running a blade ahead of the leader, crimp a large leader sleeve or a lead shot a foot in front of the leader to keep the straw or treble hook from sliding to the blade and clevis. Borrowing a trick from salmon anglers, rig 3- or 4-inch soft plastic squids or hoochies, as they're called on the West Coast. Add a hoochie to the rear treble hook of your trolling lures to create a larger profile without greatly increasing drag created by the lure. This combination is deadly when muskies crave the largest meal possible. Hoochies also add color and give a wider wobble and swing to a lure. To further increase tail action, make a chain of 2 to 4 split rings from the back of the lure to the rear treble. The longer the chain, the greater the swing. To keep the hoochie body from sliding down the shaft of the treble hook, push a 1- to 2-inch section of a plastic worm or grub body onto the shaft of the hook. Superglue the soft plastic in place, then run the body of the hoochie down the shaft of the treble and allow it to ride securely on top of the soft plastic. We all have our comfort zones — a certain style or lure size from which we are reluctant to deviate. Jim Reynolds, a trophy muskie hunter fishing the big waters of the St. Lawrence and Niagara rivers, long ago realized there's no such thing as a lure too large for trophy muskies. As a result, he began making huge (10- to 21-inch) custom versions of his favorite lures. They're not only freakishly large but Reyonld's Mr. Toothy lures also dive deeper and displace more water than any lure being used on these pressured waters. 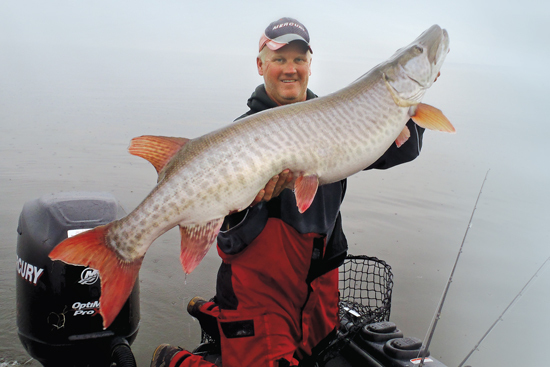 Big muskies have taken notice. While not in the same category as the Mr. Toothy baits from a size perspective, lures like the Rapala X-Rap Magnum, Sebile Koolie Minnow BRL, Livetarget 158D Yellow Perch, and Yo-Zuri Hydro Hydro Magnums are highly effective trolling lures. Trolled, these deep runners contact main-basin muskies that stay deep all summer and relate to schools of suspended ciscoes and whitefish. To make certain nothing comes undone on the strike when fishing these big deep-divers, try using two Down East-style rod holders mounted in line. Secure the foregrip of the rod in one rod holder and the rear grip in the second holder. There's no fear of a rod disappearing with this trick. All lures have a maximum depth when trolled. Anglers are programmed to run shallow baits in skinny water and diving lures in deeper water. Some of the finest shallow trolling lures, including Super Shad Raps, Bucher Shallow Raiders, Grandmas, and Drifter Double D's, never get exposed to muskies in deep water. Unassisted, these baits max out at a trolling depth of 8 feet or less. To fish deeper, anglers may abandon the succulent wobble of these lures and choose deep-diving models with entirely different actions. To keep these prime lures in your trolling spread when a few extra feet of depth are required, try adding 1- to 3-ounce in-line trolling weights, like Bass Pro Shop's Keel Trolling Weights, to your lines. In-line weights also serve as weed deflectors to keep baits running clean. To run even deeper, use removable weights like the Settele Weight System to add 12 ounces or more to get favorite baits into the strike zone. Volumes could be written on the dynamics of line selection for muskie trolling. Modern braids like 80-pound PowerPro are bullet-proof in this application. Heavy braids are as strong as nails and wear well, lasting an entire season without issues. But in some situations, a lighter braid, like 40-pound test, performs better when you want maximum depth from mid-sized crankbaits. The equations of line strength versus line diameter, and depth of lures then come into play. In extra-cold conditions where braid freezes fast since it retains water, a tough monofilament like 50-pound-test Berkley Big Game excels. Monofilament also offers added stretch, which is helpful when fighting fish but is missing from braids. Sufix, however, has addressed this issue by developing Performance Stretch Braid with 6 percent stretch. Steel and copper wire outfits can be highly effective when precisely trolling weededges and humps. Downriggers lend yet another dimension to deep-water muskie trolling, but are seldom seen on muskie boats. As an alternative to downriggers or snapweights, leadcore line provides more options for gaining depth from lures. Each of these options brings a new trick to your muskie trolling bag. While you do not need to be Houdini or David Copperfield to catch 'skies, it doesn't hurt to have a selection of tricks up your sleeve. Practice and master the tackle and you may find you can make muskies appear seemingly out of thin air. Steve Ryan, Des Plaines, Illinois, is an avid multispecies angler, world traveler, and frequent contributor to In-Fisherman. Contact: Guide Bret Alexander, alexandersportfishing.com; guide Paul Delaney, lateeyessportfishing.com; Jim Reynolds, 585/670-0422.